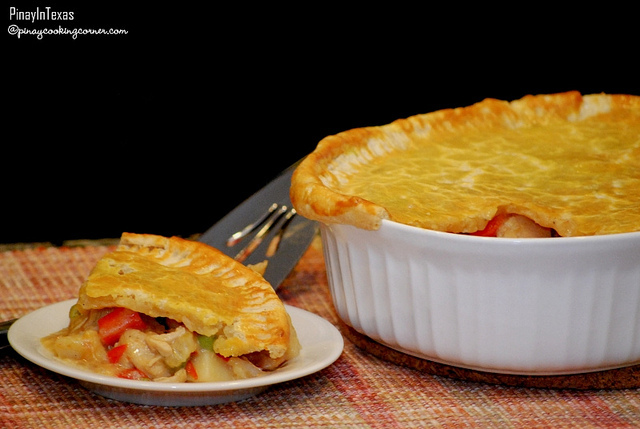 Chicken Pastel is a hearty casserole dish that is usually served with pie crust on top. A typical Filipino Chicken Pastel crust is similar to a buko pie and empanada crust. 1). In a bowl, marinate chicken lemon juice and soy sauce for an hour. 2). In a skillet, melt margarine and brown chicken, set aside. 3). Sauté onion, bell pepper an mushrooms then add chicken broth. Simmer for 15 minutes then add potatoes, carrots, sweet peas, sausages, grated cheese and milk. Continue cooking for 10 minutes. Salt to taste. 4). Transfer to a baking dish. 5). Pre-heat oven to 450 degrees Fahrenheit. 6). On a bowl, combine the flour, salt, cold water and oil. Mix into a ball. 7). On a flat surface, roll flat the pastry and cover the chicken pastel mixture and seal the sides by pressing on the edges. Remove excess pastry. 8). Punch small holes on the pastry to let out steam during baking then brush with beaten egg. 9). Bake until golden brown (about 15 minutes).